Bear Creek Animal Hospital Veterinarian Kelly Hepworth plays with 3-month-old Gilligan, a kitten who was adopted during the 2014 holiday season, as his resident cat Cleo keeps an eye on the two. 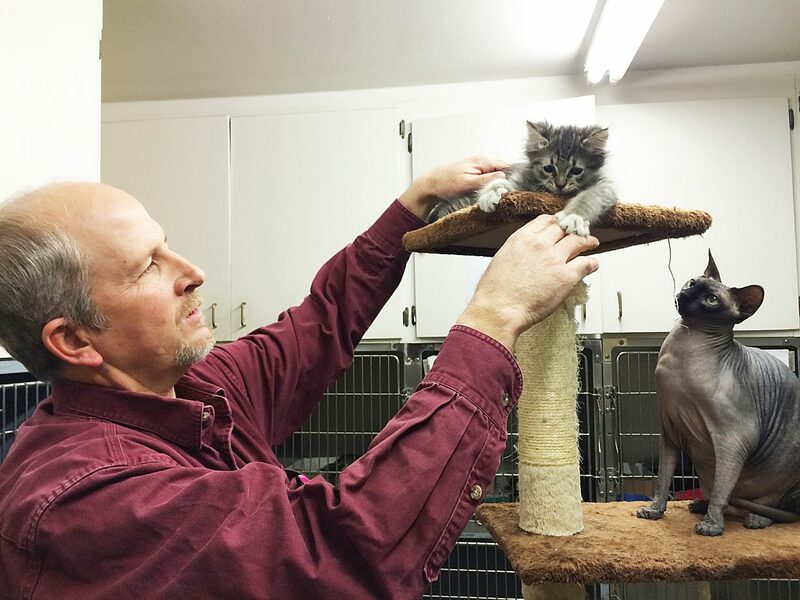 Craig — Bear Creek Animal Hospital and shelter had a good holiday season this year. Santa’s gifts to the shelter included new parents for some of their adoptable fuzzies. Lori Noland, kennel manager, said all three of the dogs the shelter had were adopted. The shelter is also down to seven cats from 15 last week. But not all of the cats were adopted. Gilligan, a fuzzy 3-month-old kitten, was adopted, but six of the other cats were transferred to other shelters. Noland said Bear Creek usually transfers to shelters in Glenwood Springs or Frisco. She said that sometimes, a certain kind of animal is in higher demand in different parts of the state, and transfers can provide supply for that demand. Adoptions don’t usually spike at Christmastime, but Noland said increased publicity might have helped. The three dogs were adopted before the shelter received any press, she said. There are more cats than dogs at the shelter, usually, and Noland said this is probably because “our little town is overwhelmed with” cats. In some parts of the city, cats have become a nuisance. Noland said while some people may have had a positive opinion of cats at one time, the number of strays in certain areas of the city has changed people’s minds. According to its monthly reports, the Craig Police Department consistently responds to more calls for animal control complaints than to any other type of call. Despite the number of strays and cats the shelter has, it won’t resort to inhumane measures to keep its numbers under control. Adoptions and transfers keep Bear Creek a no-kill shelter, except in certain circumstances. “We’d like to call ourselves a no-kill shelter,” Noland said, and Bear Creek is largely a no-kill shelter. The only exception to the “no-kill” rule is an aggressive or sick dog.